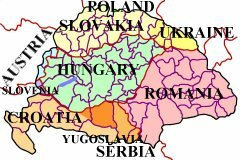 old Austria-Hungary or Austro-Hungarian Empire, now in Slovakia. Notes--Smaller places such as pusztas and many other variations in a town's spelling or name are not listed here, however, they, along with current place names can all be found in the HVF... software program. While the place names in the following table have had all accents and special letters removed for simplication in web site searching, the HVF... software program offers several methods of researching place names including with or without the proper accents. (Hint) Learning and using the proper spelling of place names, including the use of special letters or letters with accents, can be key to your success in searching the internet for websites related to the place of interest. 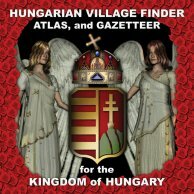 Is a comprehensive dictionary, encyclopedia, atlas, gazetteer, and directory with indexes of placenames for villages, settlements, towns, communities, and cities in the former Kingdom of Hungary (pre 1918), including those now located in Austria, Croatia, Hungary, Poland, Romania, Slovakia, Slovenia, Ukraine, and Serbia / Yugoslavia. Functions as a village finder, place locator, and town seeker when conducting a place name search. Uses official, native, conventional, variant, and current names to make finding a place of interest a more likely probability. Allows for partial name or word searching when available records are difficult to read and only a few letters are legible. Has reference maps for individual countries, megyes / varmegyes (counties), AND for every járás (district) located within each county. These so-called district maps show the location of the villages that were once part of the Austro-Hungarian Empire! Also includes indexed county / megye directories listing local churches and nearby parishes (to help locate ancestor birth, marriage, and death records), information on population and ethnicity of major inhabitants, current country locations with names, as well as other relative information, research aids, hints, and “Links” to online/Internet websites. No other resource gives you so much in one place.